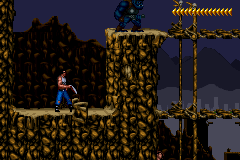 Romhacking.net - Review - Portable Blackthorne! 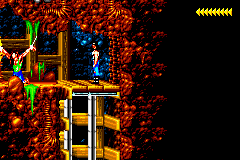 Great little fix that restores the original palette to Blackthorne. 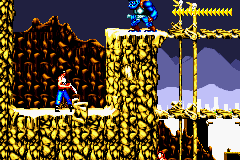 This is an excellent game that combines exploration platforming (ala Prince of Persia) with strategic gunfights, and this palette fix lets you see the game as it was meant to be seen. For whatever reason Blizzard decided that the solution to the GBA’s bad screen was to completely murder the palette of their GBA ports. 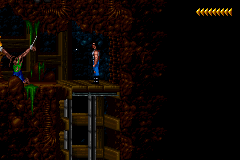 Maybe it looked right on a GBA SP 100, but on a backlit or unlit GBA (or in an emulator) it looks COMPLETELY AWFUL. And instead of making the crap palette an option, it was forced. Boo! 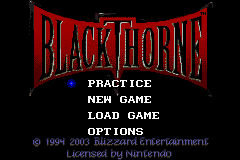 This patch rectifies that long standing problem and brings portable Blackthorne looking up to snuff. Many thanks to marc_max for fixing this underrated gem!